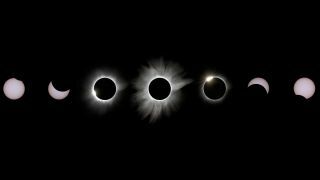 The total solar eclipse of moves through its phases in this collage taken by astrophotgrapher Justin Ng from Palu, Indonesia on March 9, 2016. The total solar eclipse moves through its phases in this collage of images taken by a veteran astrophotographer who ventured to Indonesia in order to capture the amazing view. Singapore-based photographer Justin Ng took the images from Palu, Indonesia on March 9, using a Canon 7D with 400mm lens, with a DIY solar filter. The total solar eclipse of March 9 was the only total eclipse of the sun in 2016. The "path of totality" was a 90-mile-wide (145 kilometers) strip of land and sea that stretched east across Sumatra, Borneo, Sulawesi and other islands, all the way to Hawaii. You can see more spectacular photos of the 2016 total solar eclipse here . A solar eclipse occurs when the moon passes between the Earth and the sun, temporarily blocking out the sun for some observers on the ground. Remember: Never look directly at the sun, even with sunglasses. You can learn the safest ways to observe the sun in this infographic. Editor's note: If you have an amazing skywatching photo you'd like to share it with Space.com and our news partners for a possible story or image gallery, send images and comments in to managing editor Tariq Malik at spacephotos@space.com.